Here is our new project. 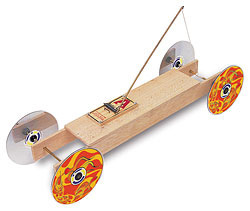 In this project, students will design and build their own vehicle which must be solely powered by a standard "Victor" mousetrap and travel the greatest distance along a specified track. Kits are not allowed. Project must be the original work of the student(s). MATERIALS: One standard-sized, single spring "Victor" mousetrap is required. This will provided to the students. All other materials to build the vehicle are legal and optional. 3. The standard mousetrap must be mounted to the chassis AND must NOT be painted or decorated. 4. Hardware may be added to the mousetrap, but the original hardware and mounting block may ONLY be altered to attach it to the vehicle. The mousetrap may not be disassembled and then reassembled. 5. The springs on the mousetrap may NOT be cut, bent, over-wound, heat-treated or altered in any other manner. 6. No part of the vehicle may be attached to any part of the track. 7. Vehicle must roll or coast along the track. All wheels must stay in contact with the surface of the track. 8. The tracks may not be modified. 1. Vehicles will be checked for specifications and impounded prior to the performance event. Vehicles will be released for trials but will remain impounded between runs. 2. Vehicles must be in testing condition prior to check-in for vehicle performance. This includes proper labeling of vehicle. If vehicles are disqualified during specification check, design changes will not be allowed. 3. Each vehicle will be allowed 2 non-consecutive runs. 4. Repairs are only allowed with replacement parts and materials. All repairs must be done in the official repair area and vehicles must be ready when called for the next round. 5. Each vehicle must be ready for competition when called or forfeit that trial. 6. Each vehicle must be in a “ready, stationary, hands-off” position prior to the start order from the judge. 7. “Start” or “Ready Position”: vehicle resting with front wheels within the “Start Zone”. 8. One team member will be responsible for launch and will indicate to the judge that the vehicle is in the ready position. 9. The team member must wait until the judge gives the “START” order. If the vehicle moves prior to this, a “False Start” will be declared by the judges. 10. Only one “False Start” will be allowed per run. Two “False Starts” during run attempt disqualifies that run. 11. Students may not touch or interfere with the vehicle once the lever has been tripped. 12. The order of competition will be randomly selected.